Sikhs have long served as a political football for all Canadian political parties, it’s time to demand the representation we deserve. On 11 Dec 2018, the report from the public-safety ministry documenting terrorist threats to Canada included a section on “Sikh (Khalistani) Extremism” for the first time — a move that has received backlash from the Sikhs across Canada, not just politicians. There has been a call for a retraction, with the argument that the short mention in the report maligns and stigmatizes the entire Sikh Canadian community, who dealt with these same sentiments 30 years ago, after the Air India bombing of 1985. In over 20 years, evidence presented by the former Crown prosecutor reveals that the threat of Sikh extremism is virtually non-existent in Canada or India. The real threat to Canadians of all stripes, supported by evidence, is the very real, and current wave of right-wing extremism accentuated by Neo-Nazis and Three Percenters. A retraction is not the end game and won’t help the Sikh community address why the community finds itself at the center of one firestorm after another. It is clear that despite having Sikh politicians and civil servants at the highest levels of government, Sikhs are pawns in Canadian politics, and some Canadians regard the community with suspicion, which makes them willing participants in the promotion of anti-Sikh propaganda. Canadians deserve better. Sikhs form less than 2% of the population in Canada and India, serving in major civil servant and ministerial roles at federal and provincial levels. Despite their positions, they have not been able to successfully advocate for their human rights in India or collectively recognize the trauma and history of India’s Sikh genocide in their new, adopted homelands where they do not face the same degree of political oppression. India has appointed and elected those directly accused of playing a role in the 1984 Sikh Genocide. In Canada, a resolution proposed by the provincial New Democratic Party (NDP) to declare 1984 a genocide was defeated in Ontario, later winning in the same province through the Liberal party, spearheaded by Member of Provincial Parliament (MPP) Harinder Kaur Malhi (this was through the efforts of then-MPP Jagmeet Singh). All of this came into play in the last trips to India of Prime Minister Justin Trudeau (Feb 2018) and Minister of National Defence Harjit Sajjan (Apr 2017), where even the fact that the resolution passed was denied in India. In both countries, we see Sikhs as the political football in the endless game of politics. Depending on who is in power and which vote bank they are catering to, politicians in both countries flip-flop on whether the pain-filled recent history of Sikhs, is worth acknowledging. It was only after 34 years, on 28 Nov 2018, that the Delhi High court in its landmark judgment, finally acknowledged the 1984 Sikh Genocide: “The large-scale rioting, mob violence, arson, plunder, genocide, and looting has been duly proved and established.” And in another judgment on 17 Dec 2018 while sentencing a former MP for a life term, the court acknowledged: “Neither ‘crimes against humanity’ nor ‘genocide’ is part of our domestic law of crime. This loophole needs to be addressed urgently." On 21 Dec 2018, the Legislative Assembly of National Capital Territory Delhi adopted a resolution on 1984 Sikh Genocide terming it “clearly and unambiguously a genocide" and the "worst genocide in the history of India's national capital." Let’s look at the numbers. In 1907, 111 years ago, harsh immigration introduced legislation to disenfranchise and deprive Sikhs of voting rights. 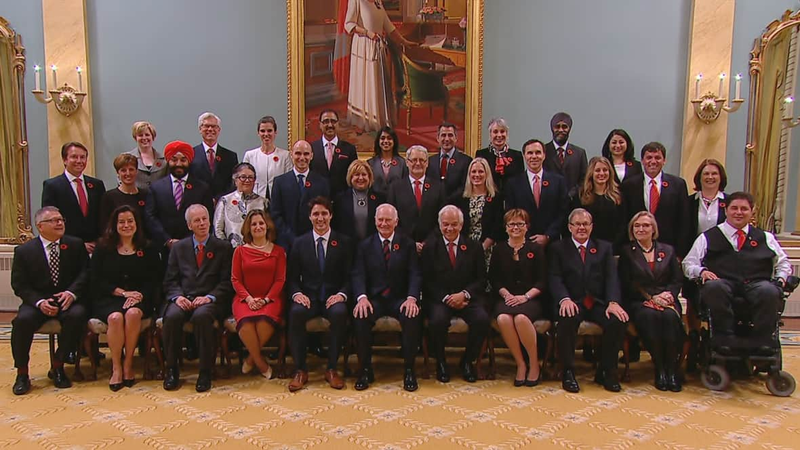 Today, of the currently ruling Liberal party in Canada, 4 Sikhs are Federal Ministers and 14 are MPs. Sikhs serve as policy makers, and their policy now says Sikh extremism is a top five threat to Canada. Further, their stance that even the act of asking for Khalistan is extremist is a denial of the ‘rights and freedoms’ guaranteed since 1982 via Canadian Charter to all Canadians. Sikh-Canadians have a right to discuss the concept of an independent Sikh homeland, and it is notable that Quebecers asking for separation are not deemed extremist. Prime Minister Justin Trudeau and his cabinet pose for a photo inside Rideau Hall in Ottawa, Wednesday, Nov. 4, 2015. Let’s zero in on four Sikhs at the national political scene: Navdeep Singh Bains (LP), Harjit Singh Sajjan (LP), Jagmeet Singh (NDP), and Tim Singh Uppal (PC).Why these four? Because they are also initiated Sikhs. In Sikh terms, this means they chose to give allegiance to Sikhi, that their turbans and kirpans (swords) are not optional. Three have served or serve as federal ministers and one is leader of the party. There are MPs now who grew up with the stigma of Sikh extremism, but they seem to be unaware of how they themselves are creating and reinforcing this same stigma for future generations. Guru Granth Sahib, the Sikh charter of spiritual-political paradigm, begins with Ik Oankar (One Force), the foundation of Sikh religion-revolution. Understanding the foundation of the the Sikh worldview -- the belief that everything is One -- is critical to understanding Sikhs as a larger community both in Canada and around the world. Stemming from the Ik Oankar paradigm is the slogan often heard by party representatives when they visit Sikh platforms: Degh Tegh Fatih. It means: “Guaranteeing economic and political freedoms shall establish victory in life.” This is from the seal of the Khalsa Raj, a Sikh historical precedent established in 1710 in the Panjab. It emphasizes that establishing just rule, informed by Ik Oankar, is critical to a healthy society. Understanding the Sikh context is crucial to understanding Sikhs, because without that understanding, Sikhs can easily be written off as extremist when in fact they are not a threat to Canada. Here are the asks: The Canadian Government should explicitly retract their offending statements and commit to further due diligence in the future. Sikh politicians must work together to form a multiparty Sikh caucus, and Sikh civil servants need to create a Sikh-leaning policy making organization. Each party must establish written platforms on issues important to their Sikh constituents. With the 2019 federal elections on the horizon, Sikh-Canadians must examine all party platforms. Sikh voters need to assess a party’s overall policies, looking beyond a single issue. A vote for any candidate is also a vote for all that his or her party stands for. It is the overarching policy commitments of these parties which should weigh far more heavily in determining how one votes. Single-issue voting is simply not responsible. The Canadian government’s job is to address risks and ideologies directly. It can do that job even better if its concerns are not party to non-evidence based propaganda from foreign governments. It can instead act extensively to protect all of its citizens from claims and allegations levied by foreign governments at a time when we know Canada's elections could be susceptible to foreign interference. All Sikh Canadians deserve better treatment than they received in 2018 at the hands of Canada, the media, and those politicians counting their Sikh votes en route to some of the highest offices in the land. The only solution, for all, is to identify with the Eternal: truthful living that sees the One in all dimensions. Harinder Singh is a thinker, author, and educator. He currently serves as the Senior Fellow of Policy and Research, Sikh Research Institute.